Hi! I have an almost full box of business envelopes for sale. Naturally they are brand new, just left over from a previous business that used to need them for payroll. 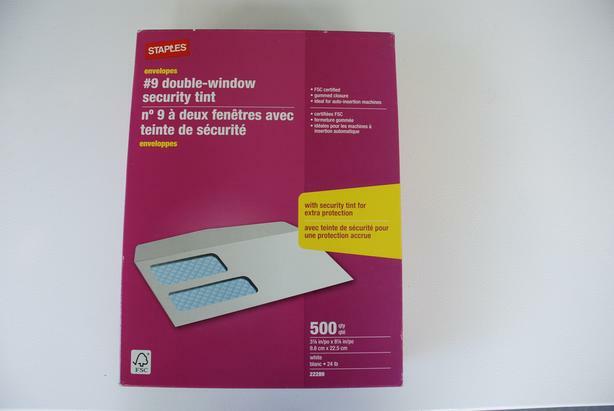 These envelopes are size #9 (9.8cm x 22.5cm), white, 24lb heavy-weight paper with a double-window and security tint - FSC certified, gummed closure, and ideal for auto-insertion machines. They are Staples brand and the product number is #22289. So, basically, they are regular white business windowed envelopes. The box started with 500; some have been used but as you can see in the photos, the box remains almost full. I paid $50 for the box: I am asking $25. I am located in Vancouver, BC but shipping is no problem. I will be happy to mail these envelopes to you using CanadaPost and Interac bank transfer. So, if you are interested in purchasing, e-mail me and we'll figure out the logistics and/or I can answer any questions you may have. Thanks!